Easy plant to keep. Make sure lighting is adequate. Does best when tied to rocks or driftwood with fishing line. Can be tied on a riccia mat to form a carpet. Small green plant with fronds sticking out of it. Many other forms of Fissidens, this one is easily recognizable. 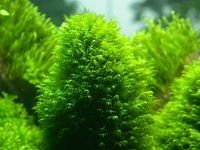 It gets the name "palm moss" because its fronds resemble palm fronds. This page was last edited on 19 August 2011, at 12:21.